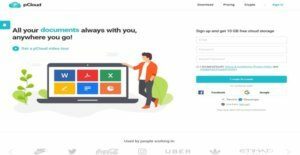 pCloud is a safe and secure cloud storage solution that permits businesses, teams, professionals, and private individuals to keep and handle their folders and files in a cloud or web-based environment. As the solution stores folders and files in highly-protected cloud storage areas or locations, users can easily access them from any type of devices such as a PC, laptop computer, or mobile phone. pCloud accelerates and improves how team members and business professionals work on various projects, making it easy for them to look for the specific folders and files they need that are associated with their projects, share them with their colleagues or other authorized persons using multiple file sharing options, generate multiple versions of files and track and retrieve the changes made to a file version, and streamline collaborative activities. The cloud storage solution guarantees all sensitive and confidential information contained in their folders and files are guarded against data security issues and incidents. pCloud protects these folders and files by encrypting them as well as allowing users to apply their own passwords. Last but not least, pCloud can be integrated with social media platforms, content management systems, and other third-party services and tools, enabling users to create cloud backups of their most important contents and files found in those platforms, systems, or tools. Whether users are utilizing pCloud for business-related activities or personal endeavors, the cloud storage solution ensures users can easily handle all their folders and files within a cloud or web-based environment. The folders and files stored in pCloud can be accessed and managed from various types of device, including desktops, laptops, and smartphones. pCloud has a search feature that enables users to input the name of the file they want to access into a search field which can be found at the top portion of pCloud’s web and mobile user interfaces. They can also filter the search results based on the file format. Users simply need to click on the appropriate icons provided by pCloud which act as search filters, and the search results are instantly narrowed down to the specific types of files they like such as a document, video, audio, and image files. pCloud is ideal for teams and professionals who are working and collaborating with each other on matters related to project management activities. Accelerating and enhancing project collaborations, the cloud storage solution offers multiple ways to smoothly distribute folders and filters, seamlessly work with each other, and successfully accomplish their projects. pCloud allows users to give direct and indirect access to folders and files stored in the solution. For example, if they want their colleagues and teammates to directly access folders and files, they can generate links to route them straight to a publicly available storage space called Public Folder. This storage space contains all the folders and files they want to give direct access to. Users can also share folders and files by sending invitations to anyone they like. They can also specify how the folders and files should be accessed by those people they are inviting. Some can be permitted to view only the folders and filters while others are authorized to both view and modify or edit them. The folders and files stored in pCloud can be accessed not only by individuals within the organization or team. In fact, they can also be shared with people that are not involved with the project or activity like family members, friends, and other acquaintances. This is made possible by generating download links. When users share a download link with somebody, that person can download the folder or file to his or her own computer or mobile device. Meanwhile, if they want anyone to transmit and store folders and files to pCloud, they can generate an upload link for such purpose. With pCloud, it is possible for users to create multiple file versions and keep their trackable and retrievable records. File versions are stored for 30 days. Meanwhile, users can extend that time period by subscribing to a premium plan or purchasing the extended file history add-on. It lets them access any previous versions of their files and track the changes or edits that were applied to such versions. pCloud is a safe and secure cloud storage solution. It employs the most advanced and sophisticated data encryption techniques so that all the valuable, sensitive, and confidential pieces of information are guarded against any type of security threat. In addition, users are given the option to apply encryption to their folders and files even before they transmit or store them in pCloud called client-side encryption. Users can utilize pCloud to back up files and contents found in any social media platform, content management system or third-party tool for storage or security purposes. It streamlines how users create backups of important files and keep them in a safe and secure cloud environment. Each business is different, and can need a particular type of Collaboration Tools Software solution that will be designed for their business size, type of customers and staff and even specific industry they deal with. We advise you don't count on getting a perfect solution that will work for each company regardless of their background is. It may be a good idea to read a few pCloud reviews first and even then you should pay attention to what the solution is supposed to do for your business and your staff. Do you require a simple and straightforward app with only elementary features? Will you actually make use of the advanced functionalities required by experts and big enterprises? Are there any specific features that are especially useful for the industry you work in? If you ask yourself these questions it is going to be much easier to find a trustworthy software that will match your budget. How Much Does pCloud Cost? We realize that when you make a decision to buy Digital Asset Management Software it’s important not only to see how experts evaluate it in their reviews, but also to find out if the real people and companies that buy it are actually satisfied with the product. That’s why we’ve created our behavior-based Customer Satisfaction Algorithm™ that gathers customer reviews, comments and pCloud reviews across a wide range of social media sites. The data is then presented in an easy to digest form showing how many people had positive and negative experience with pCloud. With that information at hand you should be equipped to make an informed buying decision that you won’t regret. What are pCloud pricing details? What integrations are available for pCloud? If you need more information about pCloud or you simply have a question let us know what you need and we’ll forward your request directly to the vendor.